"When asked, the Bundesbank was able to report all bilateral balance of payments positions of the Federal Republic of Germany with the United States”, Felbermayr noted. "The Bundesbank data also tend to agree with the American data. As long as the EU is unable to provide consistent data on economic relations with the US, recommendations for possible retaliatory action can only be insufficient." Germany had 159 country trade surpluses in 2017; EU world’s top exporter - see also data on tariffs. "There are good reasons to trust the US data. In the US, there is a uniform, statistical data-collection framework, whereas data in the EU are calculated from of 28 sources, some of which are incomplete. Also, in the current trade dispute with the EU, the US is not interested in showing a balanced current account, while the EU has a tradition of emphasising the benefits of surpluses." The IMF says Japan is a leader in robot production and industrial use. The country exported some $1.6 billion worth of industrial robots in 2016—more than the next five biggest exporters (Germany, France, Italy, United States, South Korea) combined. Japan is also one of the most robot-integrated economies in the world in terms of “robot density”—measured as the number of robots relative to humans in manufacturing and industry. 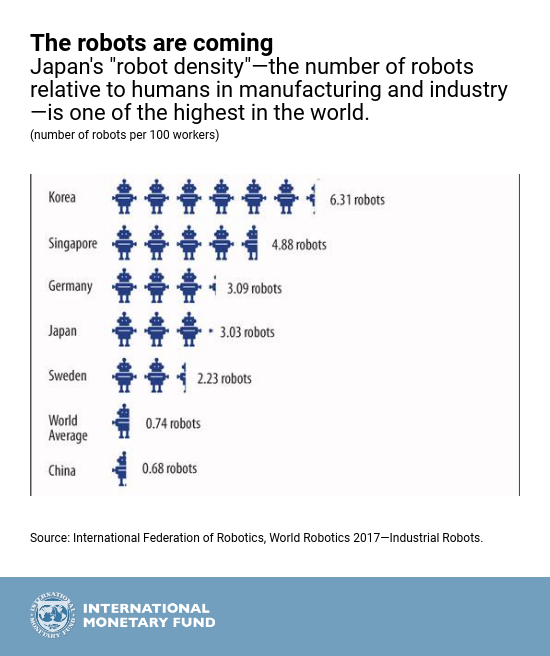 Japan led the world in this measure until 2009, when Korea’s use of industrial robots surged and Japan’s industrial production increasingly moved abroad.